Happy Season 2 day, folks! I don’t have a fancy intro and you guys are probably either too busy playing or too eager waiting for servers to not skip straight to the questions (or, let’s be real, the comments). Q4tQ: Max ilvl is increasing tomorrow to i425. What was your highest piece of gear from non-mythic/rated sources? Q4TQ: Has anyone here completed the “fancy” version of their Arathi Warfront gear set (Blizzard had the great idea to call all four versions the same name, so I call it the fancy set). You know, the pieces of gear you get from the single Warfront quest at the queue table. Before this past week, I had 4/8 unique pieces drop in a row. Was very happy, and I even thought that maybe there was a hidden tracker that gave you a different piece each time the event was up (I know, I’m naive – but then again, 8 pieces effectively means about 8 months, which IMO is a justified “waiting period” to collect the set). Then this week I got a duplicate belt. Sigh. Have the Warfronts even shifted back and forth enough times that someone could have the full set yet? I know I don’t have all the pieces, and I’ve missed maybe one Warfront? If that? I’ll be honest, I was a bit surprised when I got my first duplicate piece. It seems like something that’s limited to ~once every two weeks and requires at least 8 pieces should be more reliable but oh well. Side note: I hate — hate — that these versions are not in the Appearance window. It makes no sense, and it’s even more confusing because Blizzard decided to name pieces the same across sets. Seeing, “You’ve earned the Footpads of Yadda Blah Blah appearance!” only to open the Appearance tab, see that you don’t have the Warfront’s foot-slot appearance, and mouse over to see the name of the missing foot-slot is still “Footpads of Yadda Blah Blah” is just… it’s nonsensical. ENO KNOWS WHAT DAY IT IS… IN MORE WAYS THAN ONE! Oh fun, it’s Questions for Mitch day! QftQ: What are you looking forward to the most in Patch 8.1.5 at the start of Season 2? To be honest, I haven’t really put much thought into it. The Season 2 changes largely boil down to “item levels will be higher,” which is more or less a passive change that won’t impact how I play. But I am definitely looking forward to the Reaping Affix and the advent of Bwonzombdies. I’m also excited to start a PVP Season from the get-go. Q4TQ: What happens to my valor points titan risidiuum tomorrow? Whether you were joking for the sake of a classic meme or not, Residuum will not reset or cap between Seasons. However, costs — and rewards — from the Residuum vendor (the dude next to the transmog area in your faction’s BFA capital) will be going up by quite a bit. What is UP with the way Azerothians store their food? Sacks of grain EVERYWHERE, just lying around, open to the elements… did they learn NOTHING from the experience of the Plague in the Third War?!?!? THE GRAIN WAS INFECTED. Geez… Azeroth needs Food Inspectors BADLY. Honestly, that’s a fairly good question: Did they ever learn about the Plagued grain? At least in terms of the Kul Tirans and Zandalari, they’ve kind of been closed off from the rest of Azeroth. I’m pretty sure they don’t know about it — and also pretty sure that’s why Horde have a World Quest (or quest-quest? something…) to poison the grain supplies. Why reinvent the wheel when you can take credit for it to an entire nation of people who’ve never seen it? Though, in this case, it’s a very deadly wheel that said nation probably doesn’t want to learn about. On a similar note, does Taelia know anything about her father? Does Anduin? It’s come up before, but there’s a big question about who canonically knows what happened to Bolvar. You’d think more people do by now — because Death Knights — but then again… has it ever come up? Q4tQ: Are we really killing Jaina [today]? I am a till the day I die Horde only player, but even I like her and want to see more of her, and more sea shanties being sung about her. 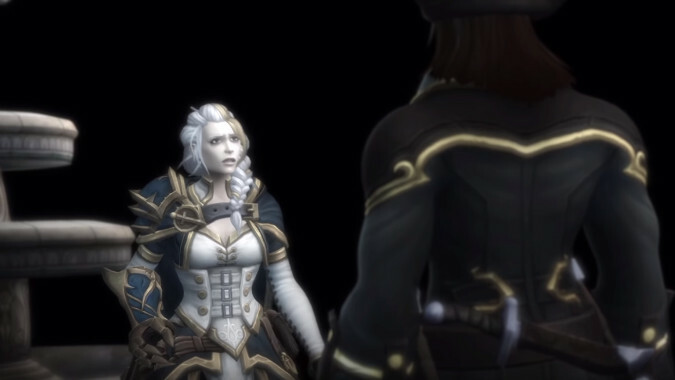 I hope this doesn’t count as a spoiler — and if it does, sorry, you’re on a site whose purpose is to talk about Blizzard games ¯_(ツ)_/¯ — but Jaina isn’t being killed in the raid. I guarantee you’d have heard a huge uproar by now if she were. That said, there may be any number of cinematics that play out during the raid which weren’t shown during PTR testing or available via datamining. If/when those drop, that’s more the sort of thing I’d consider a legit spoiler to discuss — at least for a week or so. Q4tQ: Do you consider the Battle of Dazar’alor to be a new raid tier? It sure feels like it with the new PVP season starting and the ilvl rewards being upped and new transmog to collect, but in Legion the analogous raid (Nighthold) wasn’t a separate raid tier. I do, yes. If for nothing but the fact that we knew about Nighthold before Legion launched and the Battle for Dazar’alor was announced after BFA’s launch. I was going to say Emerald Nightmare had a low number of bosses for an entire tier, but… apparently Uldir only has one more than Nightmare did. I dunno, I guess it also marks a pretty major turning point in the story, too. Preach had a very interesting video the other day which brought up an interesting point. How many pieces of your gear that you have equipped right now do you actually care about? And how many of the pieces could you actually name without looking at your character? When i think of my characters, or the gear they have, i honestly couldn’t care less about any single slot because i know that once i like it i’ll probably get a titanforged upgrade. Or i’ll replace it with a marginal improvement. Even weapons don’t really feel that impactful (i mean you feel more powerful, but i don’t feel an emotional attachment). Comparatively, i remember friends spamming chat with their badass new belt they got during BC and most of Wrath because it was legitimately the BIS You could have in that slot. Name-wise, no, I don’t know the names of many pieces of my gear. However, I do genuinely care about my headpiece, which is the “elaborate” set from the Darkshore Warfront. I don’t remember its specific name, but I know it’s part of the Plaguebringer’s set. I mostly care about it because it looks like a plague doctor’s mask, and I have an affinity for those. As for the rest of my gear, there’s not a whole lot I remember off the top of my head. However, I will say that there are pieces whose names I never used to remember that stand out to me now because I’m using them as part of custom transmog sets. Gear being more attainable for casual players than it used to be is likely the culprit for pieces standing out less, but overall, I think that’s better for the health of the game. Mind you, I would love to see more cosmetic-only sets as a reward for endgame content, like we had with the Mists of Pandaria Challenge Mode sets. If we had stuff like that, I’d remember the h*ck out of their names. SNEAKY PETE! Seriously, it’s no competition here. Have you ever clicked on him in Dazar’alor and heard his voice line? It’s amazing. Plus, knowing the devs would occasionally yell “SNEAKY PETE!” across cubicles when he first hit internal servers will never get old to me. I think the existence of this answer, um, answers this. Everyone should have an HDMI Converter. If you happen to know where to get the best deals on some, please share! In terms of terror? SkiFree will forever be etched in my memory as the game with the terrifying monster who came out of nowhere to eat my little skier when I was like 4. Nothing can top the Abominable Snow Monster for scares. Nothing. Classic Solitaire, to be honest. Never played much of the above. I don’t even know that first one :( Gotta give this one to… GAARA!